Three former Penn State fraternity members have received jail time in connection to the hazing death of Timothy Piazza. Their sentences vary from 30 days to three months in prison. A fourth man will serve house arrest. Three ex-Beta Theta Pi Penn State fraternity members have been sentenced to jail on hazing charges in connection to a pledge's death. Timothy Piazza had consumed a large amount of alcohol on pledge bid acceptance night and was fatally injured in a series of falls. Michael Bonatucci, Luke Visser and Joshua Kurczewski all previously pleaded guilty to various charges related to Piazza's death. A judge has sentenced three former Penn State fraternity members to jail in the 2017 death of a pledge, the first defendants ordered to serve time behind bars in a case that rewrote Pennsylvania's anti-hazing law. Centre County Judge Brian Marshall sentenced former Beta Theta Pi members Tuesday for hazing surrounding the death of sophomore engineering major Tim Piazza, 19, of Lebanon, New Jersey. The sentences were 30 days to six months for Michael Bonatucci, 21, of Woodstock, Georgia; two months to six months for Luke Visser, 21, of Encinitas, California; and three months to nine months for Joshua Kurczewski, 20. A fourth defendant, Joseph Sala, 21, received three months to 10 months of house arrest. Kurczewski and Sala live in Erie. Each was also fined and given a probation term. They were all sentenced for hazing and conspiracy to commit hazing, and Kurczewski also pleaded guilty to furnishing alcohol to minors. Kurczewski defense attorney Jeffrey Veitch said they can apply to do their time on home monitoring, but it will be up to the judge to determine if they are eligible. Lawyers for the three others did not immediately return messages seeking comment Wednesday. Piazza drank heavily the night of a pledge bid acceptance ceremony and was fatally injured in a series of falls, his agonizing night captured on the house's elaborate video security system. The four men sentenced on Tuesday were generally involved in providing alcohol to pledges and pressuring them to drink, prosecutors said. "Piazza's 'brothers,' including defendant Visser, repeatedly encouraged and caused more and more alcohol consumption until his judgment and physical control of his body became severely impaired," prosecutors wrote in a sentencing memo. "This directly resulted in his slow and painful death." Prosecutors said Visser and Kurczewski set up a beer pong station as part of a series of drinking events known as the "gauntlet." Sala led pledges into the drinking course's start, prosecutors wrote, and Bonatucci handed out beer. An autopsy estimated that Piazza had consumed several times the legal limit for alcohol the night of the pledge event. He also suffered severe head and abdominal injuries. He ended up in the basement the next morning, but it took members 40 minutes after finding Piazza injured and unconscious before they summoned help. Twenty-eight members of the now-shuttered fraternity have faced charges, although the most serious allegations of involuntary manslaughter and aggravated assault were dismissed or withdrawn. Most pleaded guilty to hazing- and alcohol-related counts and received probation and community service, or were enrolled in an alternative sentencing program designed for first-time, nonviolent offenders. A lawyer for Piazza's parents Jim and Evelyn, who two months ago sued former fraternity members and a security company hired to enforce alcohol regulations, called the sentences a significant step toward justice. "Jim and Evelyn, in the courtroom for the sentencing, remain committed to the cause of eradicating hazing and the beneficial deterrent effect of the enforcement of anti-hazing laws throughout the country," said the lawyer, Tom Kline. The state's new anti-hazing law, named for Piazza, took effect in November. 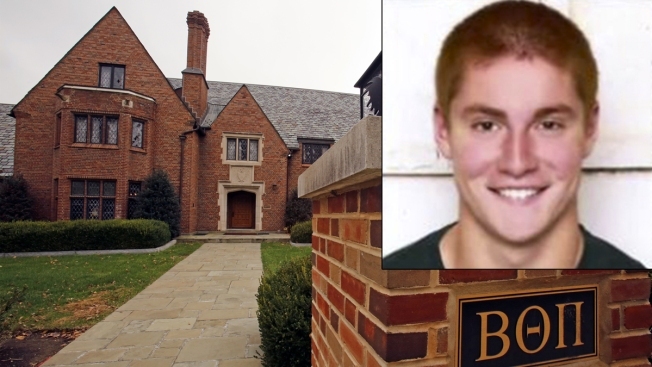 Two former Beta Theta Pi members, president Brendan Young, 23, of Malvern and vice president and pledge master Daniel Casey, 22, of Ronkonkoma, New York, face charges that include reckless endangerment, hazing and alcohol violations. Their case is on hold while state prosecutors appeal an order that evidence from their cellphones can't be used. Another member, Braxton Becker, 22, of Niskayuna, New York, is accused of evidence tampering related to the security camera footage, and his case is in the preliminary stages. Two others are scheduled to be sentenced April 15.